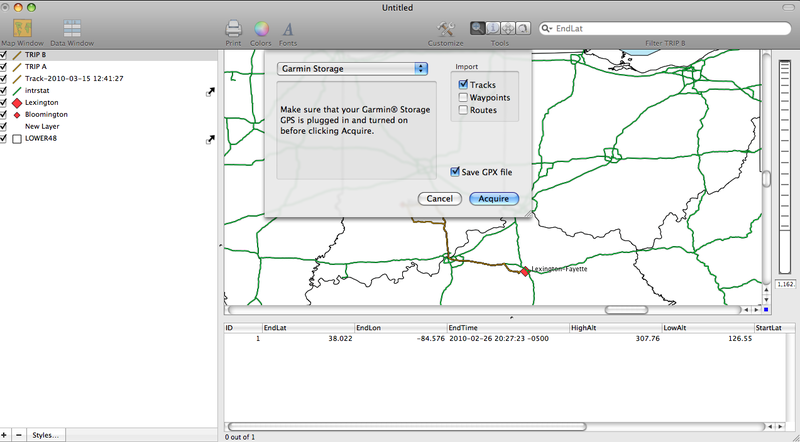 I am a frequent driver between Bloomington, Indiana and Lexington, Kentucky. In the past I have taken a route that was suggested by both logic and my GPS unit. However, recently a friend suggested that I try a different route to get home because it was faster, and a more relaxing drive. In order to determine which trip was more efficient I used my GPS unit to track my trip to see which one was better. In order to determine which trip was better I used Cartographica's GPS import ability to map my two trips and to conduct some basic analysis to determine which trip was truly better. Below I have included several maps as well as screenshots of the process of importing and creating the maps. 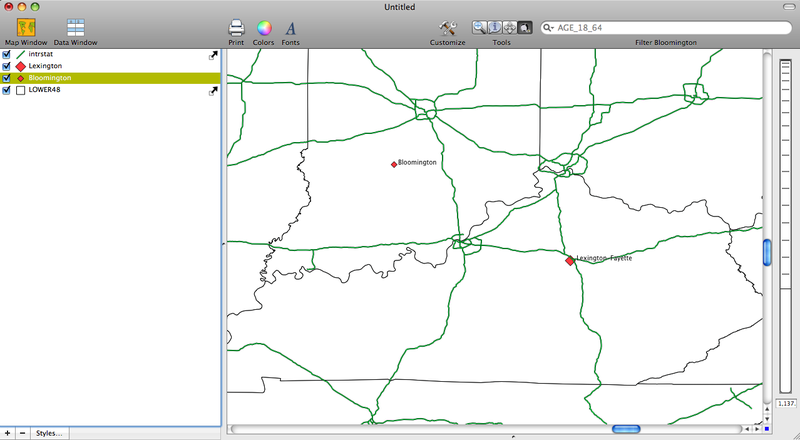 The first step in this analysis was simply identifying the locations of Bloomington and Lexington (Shown in Screenshot 1). A brief background of the two cities: Bloomington is the home of Indiana University Hoosiers and is home to nearly 100,000 residents and is famous for its rock quarries and beautiful scenery. Lexington is the home of the University of Kentucky Wildcats and the UK Basketball team which is a 1 seed in the 2010 NCAA basketball tournaments (GO CATS!!!). The Euclidean distance between the two cities is 135.81 miles and the distance by road is approximately 170 miles for both trips. 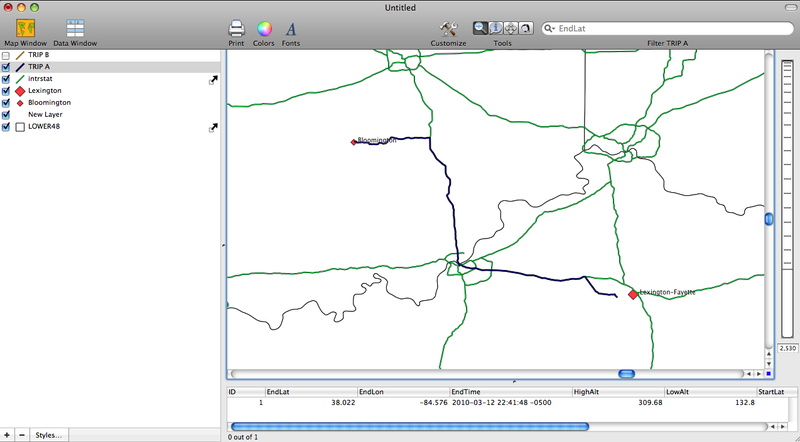 The second step in the analysis was to import the GPS data from both trips (shown in Screenshot 2) and then to create new layers for both trips A and B. You can see in Screenshot two that two new layers have been created called TRIP A and TRIP B. The next step was to examine the differences between times recorded from each trip. Screenshot 3 shows the data window for TRIP A and you can see that there is a start time and end time. For TRIP A it was determined that it took 2 hours and 55 minutes to get from Bloomington to Lexington. For TRIP B it took about 3 hours and 5 minutes. So based on these two trips it appears that TRIP A is faster. 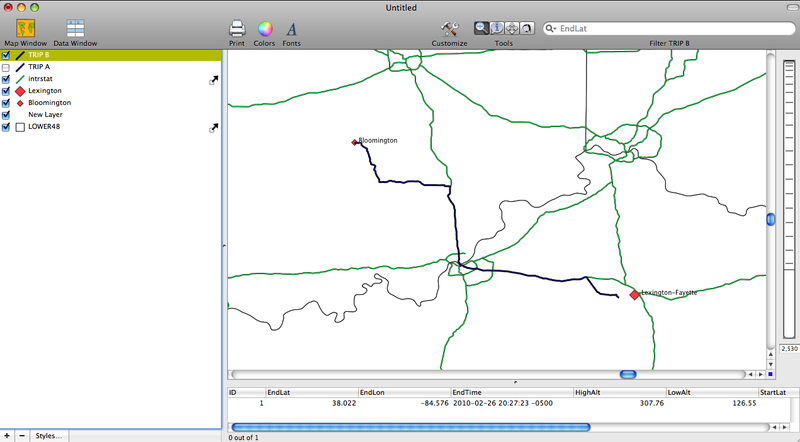 I will need to keep testing the two routes in order to determine if the difference in times holds over several trips. It is possible that I experienced factors on TRIP B that cause the trip to be slightly longer. Either way its a matter of minutes.